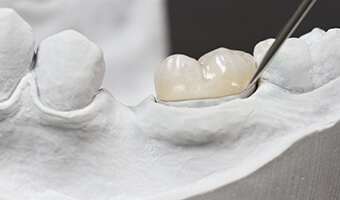 Your lab-created dental crown can be made of tooth-colored materials, such as porcelain, to ensure that it is a beautiful, natural-looking addition to your smile. Call us today to learn more about dental crowns and to schedule your appointment with Dr. Chambers, Dr. Raimondo, and Dr. Jiminez.